Is Gold Dredge number 8 haunted? Gold dredge number 8 was built in 1928 and remained in operation from the time it was finished until 1959. Located in Fairbanks in central Alaska it was operated by the Fairbanks Exploration Co for all of its working life and recovered a total of 7.5 million ounces of gold. In order for the dredge to operate water was needed for the gold recovery process. This water was brought in by the Davidson ditch which was a 90 mile long ditch dug to bring water to the various gold mining operations in Alaska. 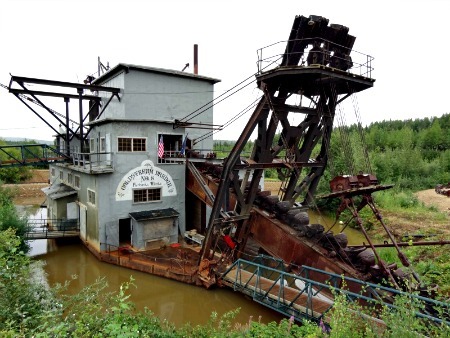 In 1984 it was listed as a historic district on the national register of historic places and then in 1986, the dredge was named a historic mechanical engineering landmark by the American society of mechanical engineers. Today the dredge operates as a tourist attraction during the summer months were it gives tours and people can have a go at gold panning. There is thought to be only one ghost who haunts the dredge and his identity is unknown. Since the dredge isn't really that big there isn't alot of room for many ghosts, which seems to be a good thing as the one that's there seems to be enough. The story goes that in the 1970's a local man who was married to a young wife began an affair with another woman. This affair carried on for some time until his wife found out and was understandably very angry. She told her family which consisted of five brothers amongst other members. The 5 brothers went to find their sisters cheating husband and chased him to near were the dredge was before catching up with him. They actually murdered him after catching him, whether on purpose or just from over-reacting will never be known, but after they killed him they tried to hide the evidence by throwing his body into the reclamation pit. The dredge wasn't operational at this time so there was no reason his body would be found at the bottom of the pit, which it wasn't for some time until 5 years later it surfaced and was found floating face down by locals. The hauntings from the man are fairly typical, doors on the dredge will open and close on their own, sometimes slamming shut. Orbs have been seen all around the dredge and have appeared in many photos. It is also said that after dark soft mumbles voices can be heard across the waters with no possible source to produce them.